After the harshest, wettest, and snowiest Vermont winter in recent memory, everyone I know is ravenously ready for Spring. It’s to the point that the sixty degree high on Sunday made us all delirious with hope, and conversely, made Monday morning’s rather ordinary snowfall seem much more ominous and depressing than it really ought to have been. “It’s just a ‘sugar snow’,” my husband Steve announced. Apparently that was the word at Mach’s, our local general store, that morning. It’s a funny term I hadn’t heard before, and I wasn’t sure to what it referred: the fact that it literally looked like a sprinkling of sugar across the transitional brown and green mess of a landscape, or the fact that it’s “sugaring time,” when the rising and falling temperatures wreak havoc with the tree sap, allowing for the hallowed practice of maple syrup production to take place on scales large and small throughout the state. If you’ve never had maple syrup fresh, by which I mean straight out of the boiling-down process, this is an experience you must try to have in your lifetime, because there is no other taste in the world like it. There is some sort of magic that is happening just then, as the water is evaporated out of the sap slowly, hovered over for hours in the warmth of the sugarhouse, that you can actually taste at no other time than right then. Likely, you will have wind burned cheeks and be stamping your muddy feet, when someone hands you a Dixie cup containing a tablespoon or two of warm, pure gold. Warning: your taste buds may very well be spoiled forever. Every year our family looks forward to the best maple-themed event we’ve encountered yet: the Merck Forest annual maple sugaring breakfast. A fundraiser for this non-profit “working landscape” of cabins, trails, hunting, livestock and farming, the event featured their first warm syrup of the season poured liberally over some very good pancakes and sausage (which used to be from their own farmed hogs, but sadly is now brought in from elsewhere.) On this day, the large, recently-built sugarhouse is crammed with chairs and long tables, coats and mittens splayed everywhere, the air redolent with smells of sweet syrup, pork fat, and hot black coffee. The line always, always extends out the warm door and into the whiteness outside. Folks are arriving in their snow boots, on snowshoes, on skis or by horse-drawn cart. In the corner of the busy room are displays and dioramas explaining the sugaring process, as well as usually some young and fuzzy Vermont man strumming a guitar. Every so often a volunteer will take groups of kids outside to let them take turns tapping a tree. When I saw the banner for the event this year hanging from Dorr’s red barn in Manchester, I was sad. Although there’s a lot I love about this project— trying an experiment, doing something differently and then writing about it, finding interesting new ways to eat, feeling healthier and more informed, bonding together as a family— I can’t say there isn’t a loss involved too. And because we are here in Vermont, that loss is inextricably intertwined with the sap of the maple tree. It would probably be going too far to say that we are alienated from our culture or our neighbors or our other family by our decision to shun sugar for a year, but it wouldn’t be an exaggeration to say that where there is gain, there must also be loss. “It’s only for a year,” I say to myself, a little anxiously, hoping that for all the effort and denial involved that we will have found this experiment to be worth it in the end. “I mean, come on,” I think, “it’s only sugar, right?” Meanwhile the “sugar snow” lays delicately outside my window, waiting to melt. 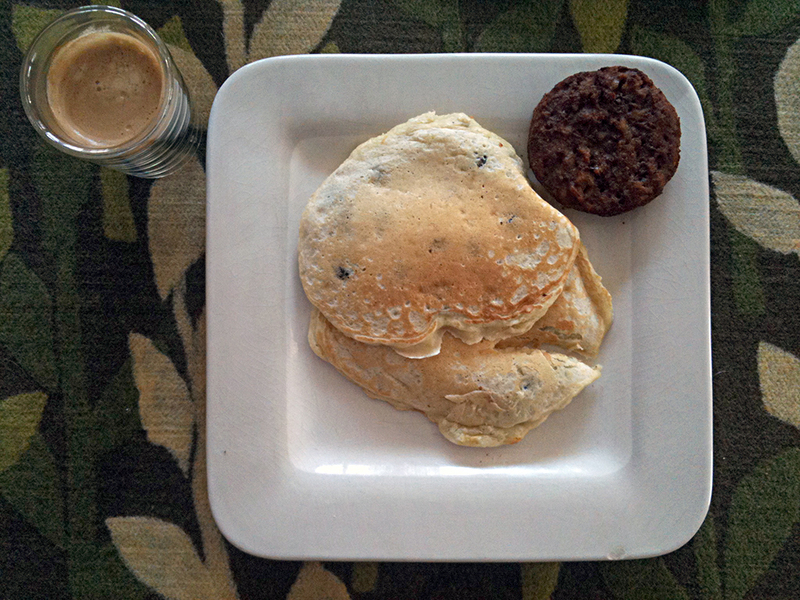 PS- At least we can still have great pancakes: this weekend Steve innovated his own version of a Joy of Cooking pancake recipe, omitting the sugar and adding in banana, blueberries and unsweetened coconut. You will truly not believe how good these are until you try them- they really are so good as to make the syrup issue superfluous. 1 cup blueberries, frozen is perfect. Pour the wet ingredients over the dry ingredients and gently whisk them together. Heat pan to medium low and cook till both sides are nice and golden!! We will be trying out these heresy pancakes and I will be reporting back with my quality control results. We have been forgoing pancakes for quite some time, since we have found ourselves completely out of maple syrup. Who would have thought you could eat live pancakes before they have been thoroughly drowned. Does this mean that “live” pancakes could be considered part of a raw food diet? Hmmmm. I’m thoroughly enjoying your “no sugar” posts. They bring me back to when I was in my early 20’s (a very long time ago) and I was “diagnosed” with low blood sugar. It was all the rage and I acquired it through a college diet made up primarily of M&Ms, Cheez Doodles and the like. My nutritionist put me on a “no sugar – no caffiene” diet forever. I did it for almost 2 years. The first 2 months were hell and then self-rightousness kicked in and I became an evangelizing, obsessive convert for that period of time. I now indulge in sugar (a life without chocolate is not worth living), but I’m much more careful about it and above all I learned how to read labels. I will be sure to try your husband’s pancakes, as they sound delicious. However, my version will be liberally sprinkled with maple syrup. I still have a little bit left of the quart we purchased at Merck during last year’s festival. The warm, sweet smell of that sugar shack is still with me. Thanks again, for your enjoyable posts. You are currently reading A Year of No Sugar: Post 33 at Eve O. Schaub.